At the end of last year, I was approached by contemporary Australian artist, eX de Medici, to work on a curious project with her. I was but one collaborator, the embroiderer of two pieces of textiles for a seat, the Seat of Love and Hate. At the time I did not realise the extent of the work ahead for me. I was in the middle of preparing for a solo exhibition, so perhaps I did not take in the detail required. I anticipated my part of the project to take two to three weeks. Once my own exhibition was installed at the gallery, I prepared the fine silk cloth by tacking on wadding and a backing, knowing my machine would prefer a heavy base cloth. I started with samples of the type of stitching, initially defaulting to a zig-zag stitch. Straight stitch seemed to be what the design was demanded. Although I padded the work it became apparent that I would need to use an embroidery hoop which can be quite limiting. It was in choosing colours, I realised the enormity of the work. I opened every box of thread stored. I set them out on a trolley sitting adjacent to the sewing table. However, in the end I needed well over forty colours. The way I was embroidering also meant I ended up having to buy thirty new bobbins so that each top thread matched. All was prepared. This aspect is what craft theorist David Pye called ‘the workmanship of certainty’. However, as a collaboration, I was heading into ‘the workmanship of risk’ (Adamson 2007: 73). The art work was not particularly designed for an embroidered textile so there were many challenges. In 2017 my new year’s resolution was make samples before I begin a work. My impetuous nature means I often launch into work without always fully resolving design issues or techniques. Regular sampling has meant a shift from the ‘hit and miss’ approach to a higher rate of success in my work. I had sampled extensively for this new collaboration, but I was nervous with beginning to machine stitch the fabric. I began with a plant I was familiar with the euphorbia, or crown of thorns. Only weeks before I had used a variety of this plant in my own work for exhibition. The certainty of risk in collaborations creates tension. Rather than negative tension, ‘tensile architectural structure, where a physical friction aids the maintenance of space between supports’ (Gates, Kettle and Webb 2013: 46). The textile design was the support structure. I was confident in my crafting abilities. Knowing that I had to extend myself to reach across what seemed to be a vast space was exhausting. I worked full-time from early February to late March on this work. As I stitched I reached a stimulating state of what Mihaly Csikszentmihayli ‘flow’ whereby hours pass by unaware. It is a zone in which the skills are challenged and one’s ability are in balance. My thought processes for other work was enriched. I didn’t have time for these other works, but I could make drawings and write notes in my journal about upcoming works that need to be created. In my journal, I had begun to write about mindfulness that I was experiencing. I had originally been writing about mindfulness and hand stitching but now I could see how one can apply mindfulness to machine stitching induced by this psychological state. As well the conversations I had with eX de Medici along the way, made me think about my own personal work in new ways. In writings on the collaborative process in the arts, very little is mention on when things go wrong. Toward the end of stitching I managed to pick up the both pieces of textiles and stitch the two together for an hour and half. I was so angry and frustrated. The intensity of the stitching meant it took three days to unpick. Sometimes an area of one-centimetre square took over an hour to unpick. I documented this furious mood in my journal over the three days. Writers on collaborations often discuss a loss of identity, self and authorship. I did not feel this had occurred with me in this project. I was the embroiderer all along. I gained a great deal of experience and knowledge in my own practice. 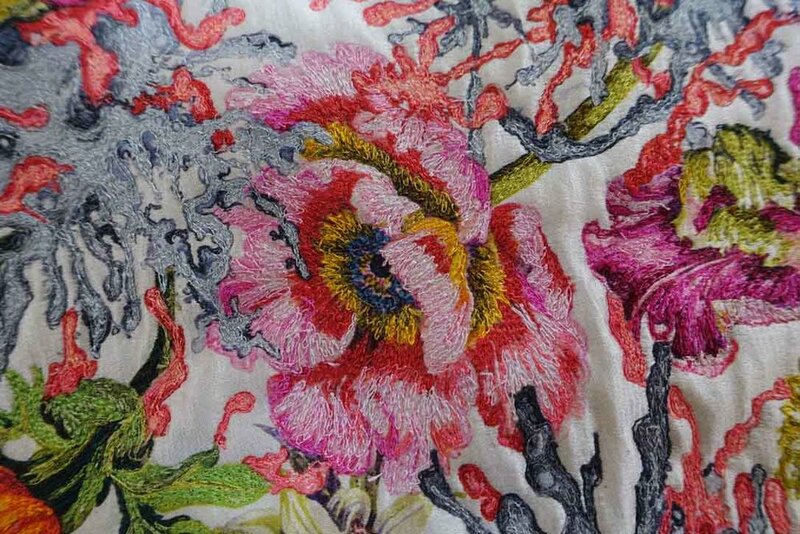 This project showed me that as an embroiderer there is a tendency to delimit my practice by continuing to work in familiar ways, defaulting to particular stitches or restricting the colour palette. I look forward to new work that I have in mind. Of being able to challenge myself to work with imagery I may not have considered.